Page 241 is now existing in the world, in a space where you can see it! Be sure to read it! Weirdly, Brianna’s first actual note of characterization back in The Electric Team #1 was when she said she’d never eaten corn before. Apparently that’s her thing, trying common foods for the first time. 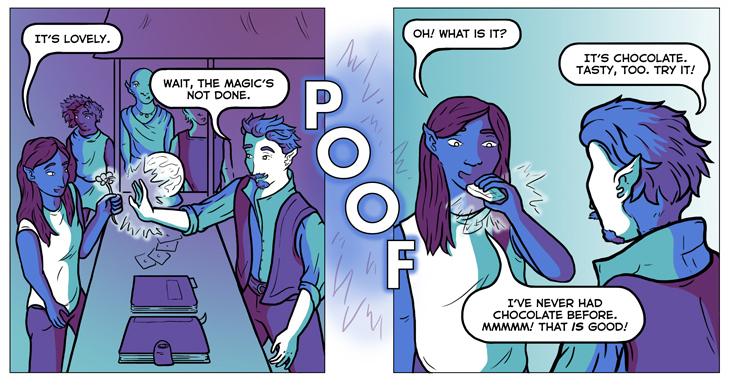 Page 240 is here! It’s a good one, too. This page introduces Jason Occult, and I’m very excited about it. I’ve wanted to share this guy with the world for a long time. I don’t remember dates well at all, and generally can’t even give you a ballpark figure of when something happened, but it just so happens I have extensive notes related to this, so I can tell you that Abi and I created the character of Jason Occult on May 24th, 2013. Wow, she hadn’t even turned five yet; that’s crazy. Weirdly enough, Jason Occult debuted almost two months before Brianna, who first appeared on July 15th, and Brianna predated the Electric Team, who didn’t come along until September 7th. 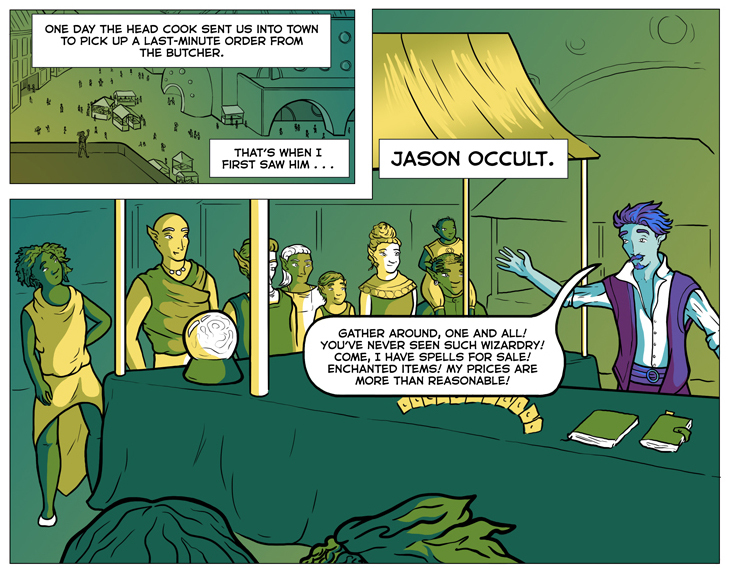 When we first brought in this new wizard character, I asked Abi what his name should be, and she said, “Jason.” I thought the name needed some more pizzazz, so I said, “How about Jason Occult?” She agreed. Now here he is, brought to live by the remarkable Sam Albert! I can’t wait to watch this unfold. The Electric Team #8 is Available for Purchase! 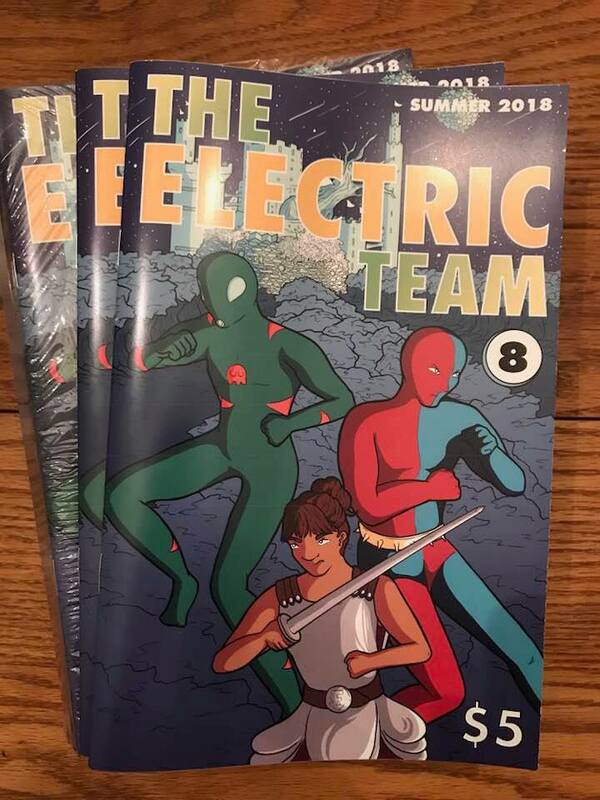 Huzzah, we have received our copies of The Electric Team #8 from the printer! And they look great! Click on the comic you want to order, follow the directions, and with just a few clicks you will have placed your order. Simple! The Electric Team #8 is, I’m comfortable saying, our best issue yet, and features characters created by Joseph Morris, Matt Kish, Byron Black, Jack Binder, and more!